The new configurations were facilitated by some of the enhancements in the new Scality RING 7.4 software, which has improving ease of use as its primary focus. 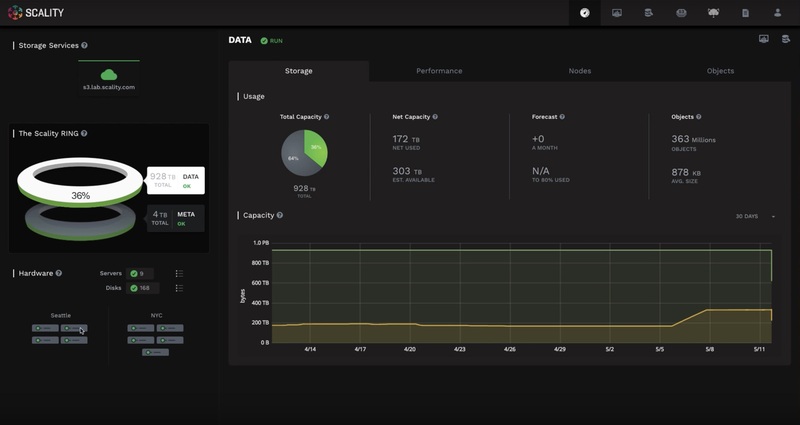 Scality, which makes petabyte-scale software-defined storage for scale-out file and object storage, has announced the 7.4 release of their RING software. This is a Long Term Support release, the final one before RING 8.0 comes out later this year. This release also helped to enable a key solution upgrade – the availability of new 3-server configurations for HPE Apollo server platforms. While traditional Scality customers like content distribution companies and service providers are unlikely to find the 3 server option an attractive one, because they tend to be larger and typically start deployments at 6 TB and up, a strong market has emerged for these smaller server configurations. They both provide a lower entry point for this type of solution, and meet the demands of specific types of customers. The new 3-server configurations specifically address this demand. All of Scality’s OEM partners will be able to deploy them, and Cisco will soon be announcing a new integration with their UCS servers, but the HPE relationship, around the Apollo servers, is the most critical. That’s because the HPE relationship is more critical to Scality than the others. Speciale said that the reduction in the entry point to three Apollo servers is also big news for HPE. RING 7.4 adds a new simplified installer, which helps address this issue. Scality’s deeper integration with HPE has led to other enhancements which will be available in the new configurations. The other elements of RING 7.4, like the new installer, are also aimed at improving ease of use. The new installer provides additional ease of use benefits. The RING Supervisor Management Portal has also been simplified. “It now shows all things under one umbrella, include unified management of file services and S3,” Speciale said. “We have added a new S3 service management console for multitenancy, which will allow service providers to stand up new accounts.” The UI now enables private labelling, so Scality partners and service providers can rebrand if they wish. A new integrated data browser responds to complaints that it had been a pain to create data in the browser. Speciale also provided a preview of what’s ahead in RING 8.0 later this year. “There isn’t a button in the UI yet to do software updates – that’s something you do externally now, but which we will bring into the console,” he said. “We will also bring firmware updates into the server. We will also have unified installation for multi-site developments, and we will do more work on provisioning workflows, especially for the public cloud.” HPE ILO APIs will also be integrated into the Supervisor Management Portal.